ISCA member UBAE (the Union of Recreational and Cultural Sports Activities) in Barcelona, Spain, has been a leading promoter and provider of sport and fitness programmes in Catalonia since the 1980s. Although around 6 million people already use its fitness centres, UBAE saw the potential to expand its programmes to a hard-to-reach group of cardio patients. UBAE’s Director of Facilities, Toni Llop writes that what initially sounded like a “risky business” soon reaped health rewards for the patients, and ISCA’s MOVE Transfer project came at the perfect time to gain the support UBAE needed to spread the programme further. UBAE has focused on the promotion of physical activity as a healthy habit from the beginning. At the beginning of the 1990s all users of the sport centres managed by the organisation were obliged to have a medical check before starting their training. At the same time we were pioneers in introducing physical activity as a way to prevent and take care of different conditions among people. A few years ago we participated in the development of a programme for teenagers based on the introduction and monitoring of fitness programmes in Barcelona’s high schools. Finally, we were interested in creating an alliance with a public hospital. This was two years ago, when the coronary and heart disease unit of Barcelona’s Vall d'Hebron University Hospital proposed for us to host a rehabilitation programme for patients who had had an ischemic illness. That was the origin of the cardio rehabilitation programme. A group of enthusiastic doctors and a sport centre managment entity focusing on the rehabilitation of different groups of patients joined efforts to help people. For sure they were a hard-to-reach population group. Honestly speaking, at the beginning we felt afraid to have such type of users in our centre. We were nervous about training a group of people with significant health risks. Day by day the participants started to show improvement. They felt better and better and their physical condition started to improve. The instructors became more confident about the programme and its potential results. We checked the possibility to introduce the project among the ISCA network, and that’s how we came to apply to be part of the MOVE Transfer project. We know the difficulties in implementing a project like this, but we thought that establishing an alliance with a hospital could be something that could be successfully developed by other entities in other countries. At the same time, opportunities to engage with other partners opened up. After our agreement with the direction of the hospital we got recognition from the Municipality of Barcelona, so we have been able to establish a nice group of partners: a public hospital, a municipality, a private organisation and a sport centre. The idea now is to extend the project and involve other sport centres, sharing the experiences acquired by the trained and skilled instructors and offering a wider range of opportunities to involve more groups of patients located in another areas of the city. 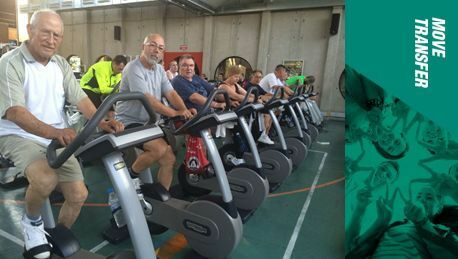 What was a trial initiative two years ago, has today become a project and the cardio rehabilitation programme is now partly financed by the organisation and supported by the Municipality of Barcelona.